The owners of the Tavern in the Square, former home of the Kells, found itself in the same position as their predecessor, explaining a series of violent incidents to the Licensing Board. Adam at Universal Hub has the details. Posted in Allston, Brighton, New Construction, Union Square | Comments Off on With parking or not, 37 North Beacon plan still alive? There were two robberies involving knives in Allston last week, one successful, one not. Both occurred shortly after 1AM on Thursday, March 21. In the first, near the corner of Glenville Avenue and Harvard Avenue, two men, one white, the other race unknown, made off with the victim’s mobile phone and wallet. The second incident, in the vicinity of the corner of Linden Street and Commonwealth Avenue, was foiled when the victim ran from the three men who were threatening him. One had first asked for a light, but followed up with “Give me everything you got.” After fleeing to the Linden Superette, he met the responding police and gave his report. The plans for a 450-seat Russian restaurant at 14-20 Linden Street are on hold for now, at least until the owners meet with Allston Civic Association and the BPD. The Zoning Board of Appeal deferred yesterday’s schedule hearing to May 7, according to Adam at UH. This expansion almost certainly would require approval from the Licensing Board. 95 years old, but who’s counting? Alice Mills, a long-time volunteer at all three local branch libraries, will be honored by the Friends of the Faneuil Branch in recognition of her dedication and to mark her 95th birthday. For many years, she coordinated ESL learning groups, which she referred to as “Friendly Conversations,” and continues this work at the Honan Allston branch. Her career ranged from a stitcher (and union leader) in a shoe factory to administrative assistant at Children’s Hospital and BU. The party is Tuesday, March 26 from 6:30 to 8PM, all invited. Posted in Allston, Brighton, Local Heroes, Neighborhood Heroes | Comments Off on 95 years old, but who’s counting? A 20-year old student had a knife held to his throat after being knocked to the ground near 21 Quint Avenue, Allston on Monday, March 18 around 7PM. After threatening him with the knife, the two thieves made off with his wallet and iPhone. The suspects were described as two white Hispanic males, both 18-22 years old, one being around 5’9″. The ever-evolving Russian Benevolent Society at 14 Linden Street, Allston wants to become a 450-seat restaurant and lounge with live entertainment, as well as adding a patio that would accommodate 90 patrons. It started out as a private social club, but has gone from that to serving the public three days a week, and last year to a seven-day-a-week operation. Apparently there was a steam room in the building as of 2010, but no mention if this is still part of the operation. The hearing will be Tuesday, March 26 at 9:30AM before the Zoning Board of Appeal in City Hall. A spate of injuries and deaths of bicyclists has prompted the city to take a look at the stretch of Commonwealth Avenue between Kenmore Square and Packard Corner. On an experimental basis, Brighton Avenue will be getting enhanced shared bike/car lane markings, according to Boston Bikes. It involves adding signs and markings in phases starting this spring. I’ve wondered if having bike lanes on side streets where possible, rather than main roads, would make for a more relaxing, and safer, road for bike riders. The few times I have ridden from Oak Square to Kenmore have been harrowing. On a visit to New York I found traveling along Manhattan’s avenues on two wheels was similarly scary, while the cross streets were fine. The body of a woman was found on the property last night, according to the Suffolk County DA’s office. The identity of the 29-year-old New Hampshire resident has not been released. The case is being investigated by the State Police. The building originally intended for the carless has been approved by the BRA, but with 35 parking spaces for the 41 apartments, along with two spots for bikes per unit. It will occupy the property at the corner of North Beacon and Everett Streets. The final approval is up to the Zoning Board of Appeals, but is extremely likely. Too bad there weren’t any changes to the size and design. Five storys is too high, and the exterior is just ugly. The no-parking aspect always struck me as a bit of greenwashing and not a new concept. Commonwealth Avenue and its side streets are packed with parked vehicles from residents of the parking-free buildings that line it. This, despite the B-line that runs up the middle. After meeting with local residents, Mayor Menino has sided with the Harvard Allston task force on the issue of relocating a number of university services to 28 Travis Street. The city’s position makes approval of the move and construction of future buildings dependent on a number of conditions, described on Boston.com. The school seems inclined to go along. How about getting the university to sell some of its Allston property? It recently unloaded the Arsenal on the Charles in Watertown. Other developers would be able to move faster, and it would be good to have some balance with not all uses oriented to one owner. 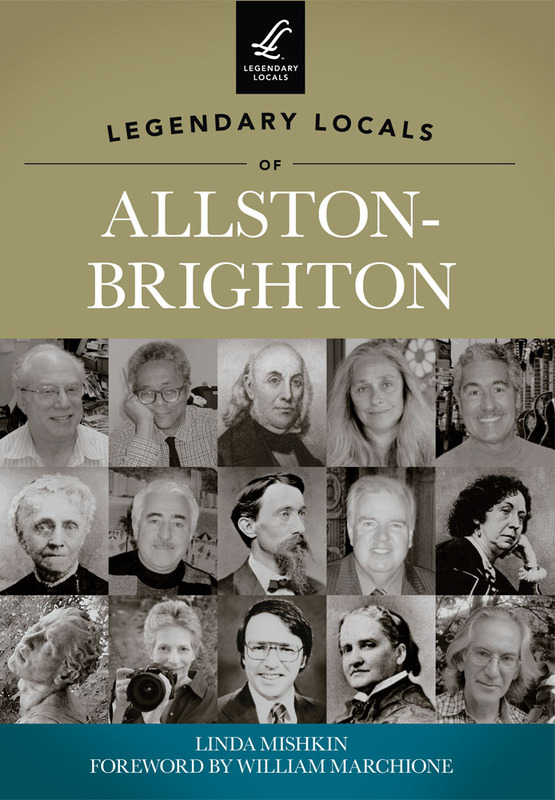 People who made a difference, past and present, are the subject of the new book “Legendary Locals”. The profiles include the Winships and their support for soldiers of George Washington, Olympic gold medal winner Harold Connolly, and present-day state representative Kevin Honan. Bill Marchione, author of “The Bull in the Garden” and a key founder of the BAHS, wrote the foreword. The author, Linda Mishkin, will have a book signing on April 6th from 1:00 to 3:00PM at the BAHS Heritage Museum/Veronica Smith Center, 20 Chestnut Hill Avenue. She will do a repeat embossing on May 7th from 6:30-8:00PM at the Faneuil Branch Library, 419 Faneuil Street in Oak Square. The Beacon Park rail yards next the Mass. Pike in Allston are now unused and empty, as shown in this photo. Harvard owns the 91 acres that are occupied by the pike and the rail tracks, which they refer to as “Allston Landing South,” but would need state approval for any development, according to the Crimson article. Some history of the site, courtesy of the Brighton Allston Historical Society. Mt. Washington Bank, a division of the mighty East Boston Savings Bank, has opened a branch in the CVS plaza on Brighton Avenue. Services are offered in several languages, including Albanian. Now that is niche marketing. Why would anyone want to join a BU fraternity? The party where a BU student was found unconscious and later died was hosted by a fraternity, Sigma Alpha Mu. The chapter has been suspended. It is the latest in a series of serious incidents involving BU frats. Posted in Allston, BU | Comments Off on Why would anyone want to join a BU fraternity?